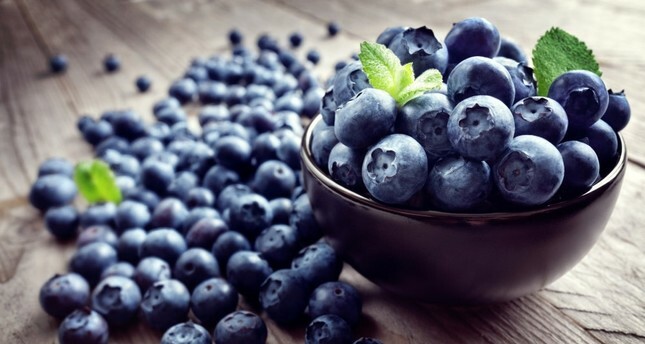 Myrtle berries are often mistaken for blueberries but, they are actually two distinctively different type of berries. I recently made the mistake of believing a sign that read "yaban mersini," which I know to mean blueberries. There they were small, round blue berries that were triple the price per kilo of other fruits. However, I felt I had to have them and proceeded to go home and immediately prepare a pie crust of which I planned to fill with these beloved berries. Luckily, I tried one of the berries first before sacrificing the entire pie only to find out that on the inside it wasn't fleshy and juicy like a fruit, nor was it even blue. Instead, the inside was an aromatic powdered white center that you would be hard pressed to cook never mind even chew. It turns out that what market vendors are referring to as "yaban mersini," which is mostly translated as blueberries and sometimes even as cranberries is actually a form of indigenous myrtle berries, called "mersin." The addition of the word "yaban" is meant to attest to the product's being collected in the wild and not cultivated. Quince is one of the most confusing fruits on the market as it is often confused with pears. These myrtle berries come in white and blue versions, with the latter bearing an extreme resemblance to blueberries. These berries are rampant in the farmers markets in fall and the Turks like to simply chew on them as snacks. However, this "snack" also has a number of medicinal properties, spanning from being an expectorant, aiding in digestion and lowering sugar levels. Not to be confused with the "golden strawberry," which they are sometimes referred to and in English are known as gooseberries, "dağ çilek" which translates to "mountain strawberries" in fact refers to what we know in English to be "wild strawberries." They stand out for being small, round and fuzzy in hues spanning from orange to pink and bright red in every single berry. Loaded in vitamin C, while these berries are sometimes prepared as preserves, the norm is to just snack on them for their healing properties against viruses, clogged arteries and even acne. "Misket limonu" is what Turks refer to as limes, however keep in mind that limes are hard to come by in Turkey, therefore, what you may be thinking is lime even if the sign says so, could very well simply be unripe mandarins, which are also used as condiments or to add flavor to teas and drinks. The month of October is the start of the mandarin season and you can find these mini lime-lookalikes everywhere for a short while. Although it may not be exactly what you were looking for, trust me these mini mandarins taste lovely and are rich in vitamin C.
Quince, referred to as "ayva" in Turkish is another fall fruit that could easily be mistaken for its friend the pear. This is because, Turkey has a wide variety of pears on offer in autumn and one of the most popular and flavorful varieties; the "deveci armut" which translates to "camel pear" is as large and lopsided as quinces can be. Quinces tend to have a slightly more pinkish hue on the outside and are much more dense and fibrous on the inside. Admittedly it is a bit of a challenge to consume quince, however this fruit serves as the basis of a popular dessert consumed throughout winter and is also regularly prepared as a jam. This month the farmers' market stalls will be laden with fresh garlic, which could easily be mistaken for green onions in a heartbeat. While the stems are slightly thicker, if you look closely you can discern thin lines in them that can set them apart. It's not the end of the world should you confuse them as green onions and fresh garlic can be used similarly, however the taste of the latter is a bit heavier when consumed fresh in salads. Garlic is believed to be beneficial for the heart and infections and was said to have been consumed heavily during the building of the Egyptian pyramids and even as a performance enhancer for the first Olympics held in Greece. You may have caught sight of green tomatoes in the market this month; well these are specifically sought after by the Turks in the fall months to be used in the preparation of pickles. Similarly, you may see bright green olives in the market that are hard to touch and sour to taste and you may ask yourself why would these be for sale at this time? The answer is so that people purchasing them can preserve and brine them in the style of their choice to be consumed in the weeks and months ahead. This is all part of the pantry preparing process that many Turkish households traditionally embark upon in the autumn months. Pomegranates are cooked into molasses, green tomatoes are turned into pickles, olives are left to sit in brine and tomatoes and red peppers are made into pastes. Another factor to keep in mind is don't confuse your pepper with your tomato pastes when purchasing handmade versions as the colors are similar but the taste varies greatly. "Kudret narı" which translates to "powerful or potent pomegranate" is what is referred to as "bitter melon." Resembling an orange colored blossom flower, "kudret narı" is prepared as an extract by soaking it in olive oil or water in a jar. It is sold regularly in the farmer markets in this season as medicine for its properties of easing stomach aches and even hemorrhoids. Perhaps the best disguise for another product would have to be the carob. Referred to as "keçiboynuzu" this long, brown dry bean is ground down into powder form or an essence, which can be used in making desserts or even mixed with milk as a faux hot chocolate. Believed to be good for the lungs, immune system and in increasing red blood cells, this is one of the most enjoyable natural medicinal products out there.